Quinoa crazy at the moment. This little grain is the superfood of superfood. It is a complete protein containing all 9 essential amino acids, has twice as much fibre as most other grains, high in iron, rich in magnesium, high content of manganese (which is an antioxidant), high in Riboflavin (B2) and the obvious Paleo, gluten free, low fat and low carb. Inspired by Asian flavours, I wanted to create a salad with the sweet, sour, salty balance. My best friend did not have faith in me that these flavours would work well with Quinoa, I proved her wrong – HA! This dish can be made a couple of days ahead, would be great for a bbq lunch or just a simple starter. Cook quinoa per packet instructions. I always cook mine in chicken stock, adds more flavour. To make the dressing, place all the ingredients in a jar and shake to combine. Set aside. For the salad, place the quinoa and salad ingredients in a large bowl, toss, add the dressing. Place in the fridge. Salad can be made a couple of days ahead. Combine the prawns and marinade, place in fridge for at least an hour or overnight. To cook prawns, heat a oiled frypan or bbq and cook until golden. They wont take very long, as they have been tenderising in the lime juice. 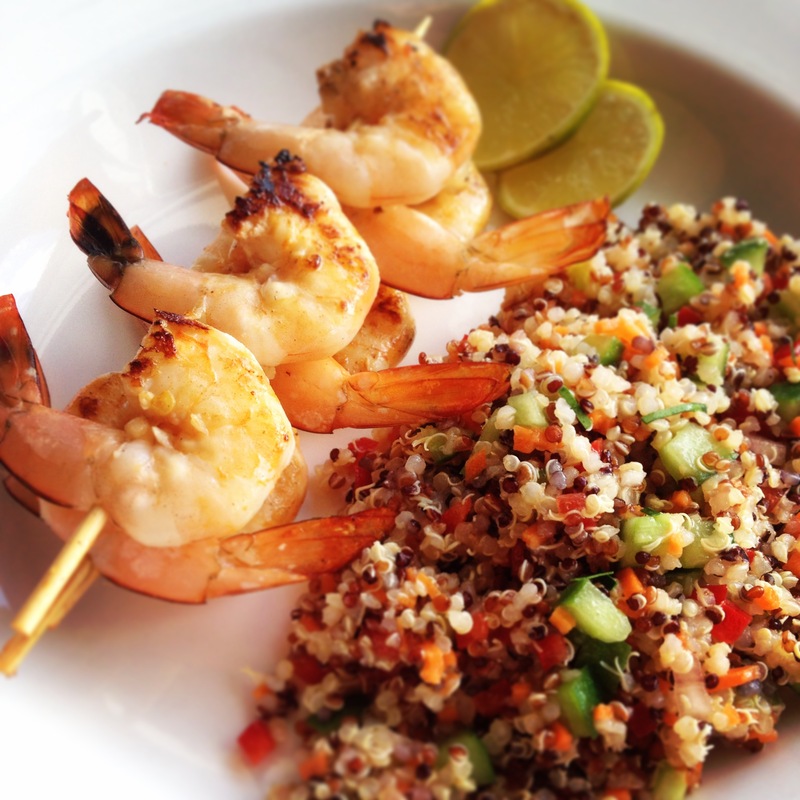 To serve, place quinoa salad on a plate, top with the prawns, thai basil, kaffir lime leaves (finely chopped) and a lime wedge. Firstly yum! But I was wondering how you juice your limes? And secondly where can I get Julianne carrots? I can only find normal, baby or heirloom varieties at my local supermarket. Oh yum. Looks delish. Will have to try this – I tried quinoa for the first time last night (cooked to a recipe by Tori Haschka in case you want to look her up) and loved it, so will definitely give this a go, too. Lovely photography you have to go with your posts, too.